Jebaraj has been serving as interim director of the center since April 2017, when he took over from Kathy Deck. Jebaraj earned a bachelor’s degree in economics and international relations from the University of Arkansas in 2007 and a Master of Public Administration in public policy from the U of A in 2011. He was previously the assistant director at the center, where he has worked since 2007. During his more than 10 years at the center, Jebaraj has been instrumental in creating and executing economic studies for clients such as the Arkansas Economic Development Commission, the Northwest Arkansas Council, the Walton Family Foundation, Arvest Bank, the University of Arkansas and many others. He has been recognized as one of the “Fast 15” by the Northwest Arkansas Business Journal, as one of the “20 in their 20’s” by Arkansas Business, and as a member of Leadership Arkansas Class VIII. He is an exceptional source of business and economics-related expertise whom journalists and business people alike rely on to understand how national and regional issues impact Northwest Arkansas and the state as a whole. 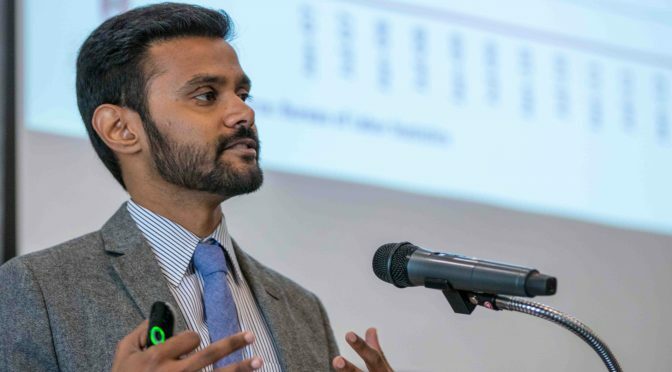 Jebaraj has made presentations that share the center’s expertise directly to more than 5,000 individuals annually, and tens of thousands more hear and see his economic analysis and commentary through TV, radio and print media.